October 14, 2017. KDE today announces the release of KDE Frameworks 5.39.0. New module: QtQuickControls 2 style that uses QWidget's QStyle for painting This makes it possible to achieve an higher deree of consistency between QWidget-based and QML-based apps. 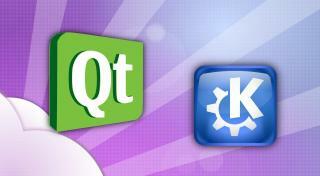 The complete source code for KDE Frameworks 5.39.0 may be freely downloaded. Instructions on compiling and installing KDE Frameworks 5.39.0 are available from the KDE Frameworks 5.39.0 Info Page. Building from source is possible using the basic cmake . ; make; make install commands. For a single Tier 1 framework, this is often the easiest solution. People interested in contributing to frameworks or tracking progress in development of the entire set are encouraged to use kdesrc-build. Frameworks 5.39.0 requires Qt 5.7.